Yesterday the Mt. 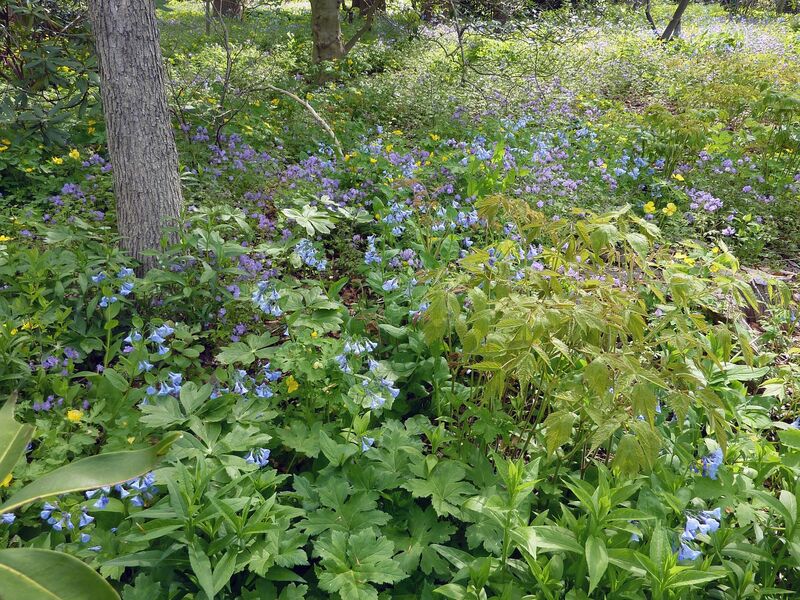 Cuba Center held their 9th Annual Wildflower Celebration. I've always loved the Mt. Cuba Center for it's wonderful classes, it's beautiful gardens, and the best part is, it's almost entirely comprised of native plants that are laid out in a naturalistic setting. One of the glorious things about this type of garden is that there's always something different flowering each time you go. 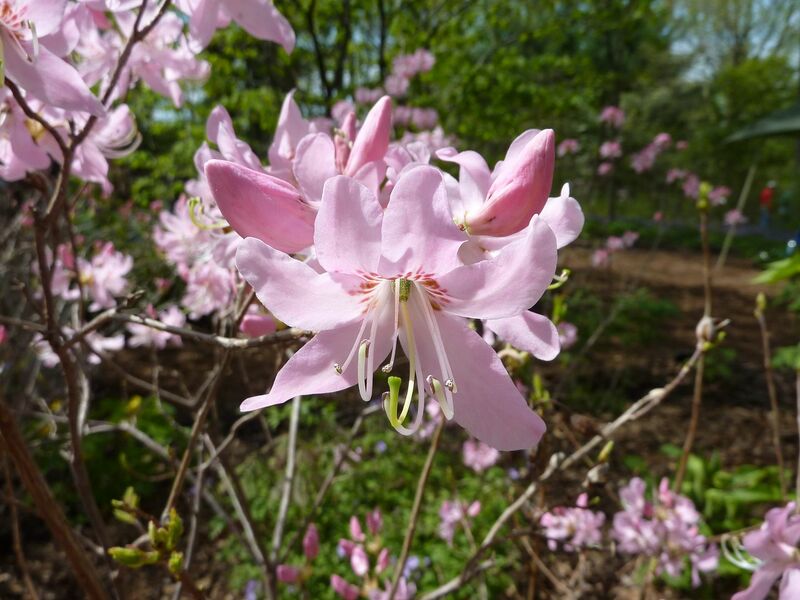 Plants tend to bloom at certain times of the year but depending on what type of winter, how warm the soil is, and how much rainfall we get, that bloom time can change dramatically from 4 sooner or later. And every plant reacts differently to these factors so there's always bound to be something different happening each time you go. 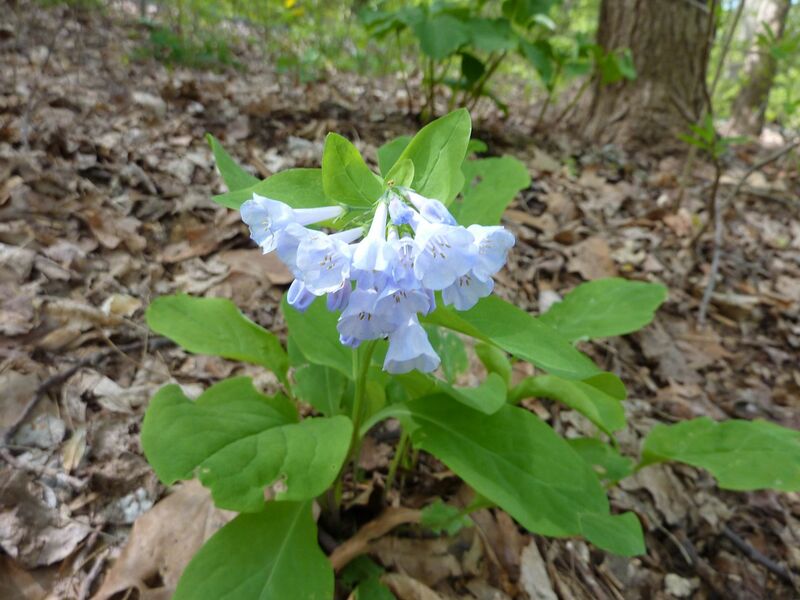 For example, last year I saw loads of milkweed already pushing through the soil, there were loads of Amsonia in flower along side Wild Hyacinth, and loads of Foam Flower lining the walk ways. 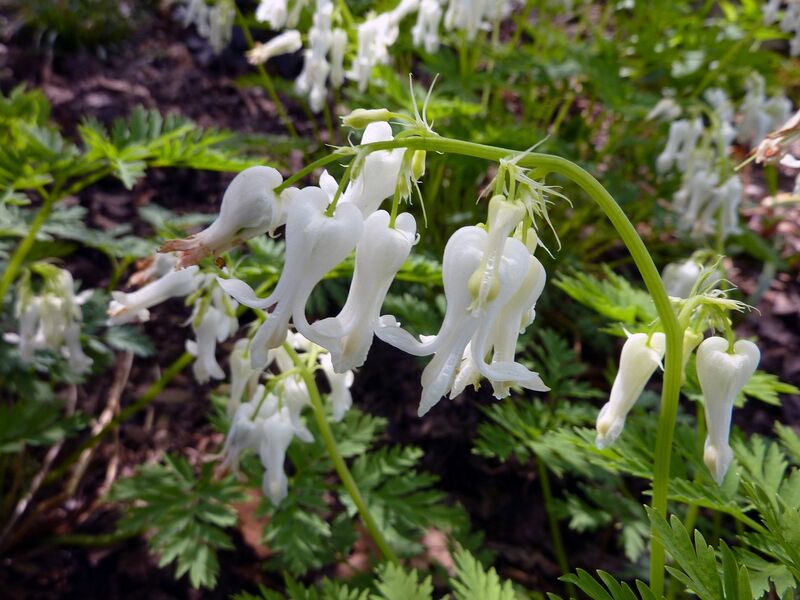 This year, Milkweeds had only just poked out of the ground, Amsonia was present but not flowering yet, Wild Hyacinths were unnoticeable, and the Foam Flowers had just opened their first blossom. 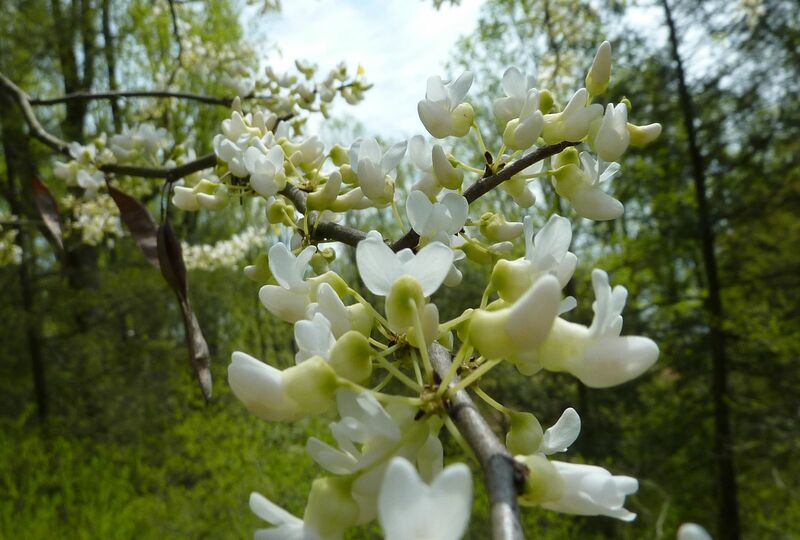 Their white flowering Eastern Redbud, Cercis canadensis var. alba, greeted visitors as they came in. Normally this species is pink but this variety lacks those pigments. What I found more surprising was they had an assortment of this species that was actually had red flowers! Really they were a bright magenta but it was still stunning to see. The white flowering type I think worked best where there was a lot of black in the background, as either a very shaded forest, or dark trunks to trees. 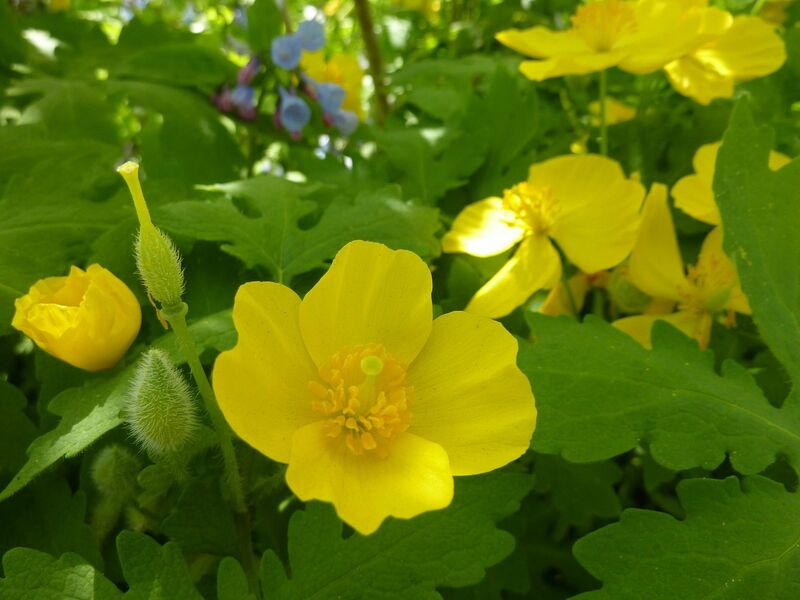 Woodland Poppies, Stylophorum diphyllum, were the first wildflowers to abundantly line the paths. Droves of May Apple, Podophyllum peltatum, used to overwhelm this plot of land and I can see they've either been thinned out or are just a few weeks behind schedule. None of the May Apples were flowering yet. But that's all to the benefit of the woodland poppy, a plant who's seeds are dispersed by ants thanks to the elaiosome coating their sees. They're a lot easier to grow than Trilliums and get my recommendation whole heartedly. 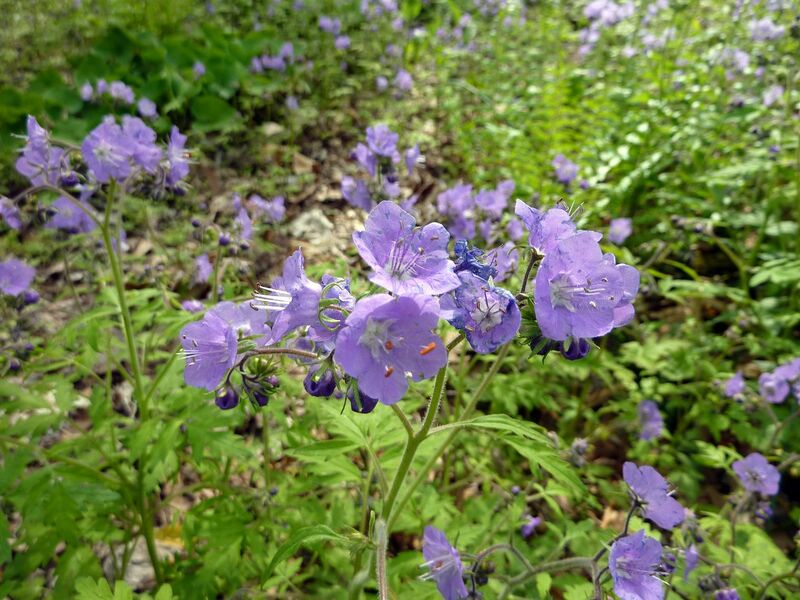 Fernleaf Phacelia, Phacelia bipinnatifida, quickly joined up the trail. 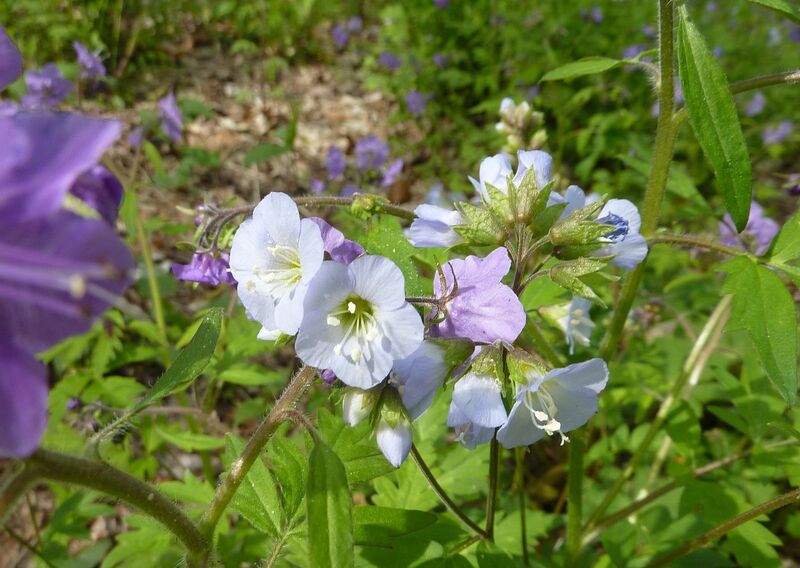 This is a wildflower that almost no one seems to sell, either as seeds, or bare roots. 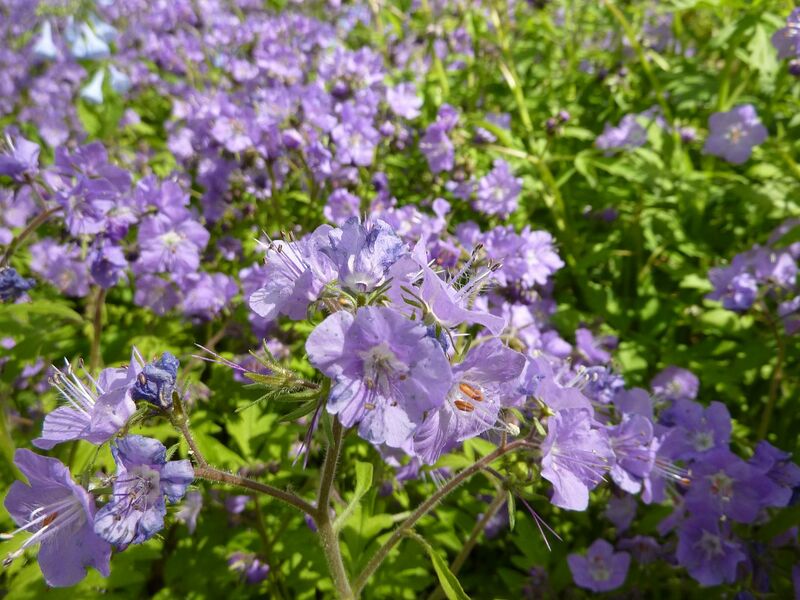 It's one I've been after because I know honeybees love it, as well as other Phacelia species. 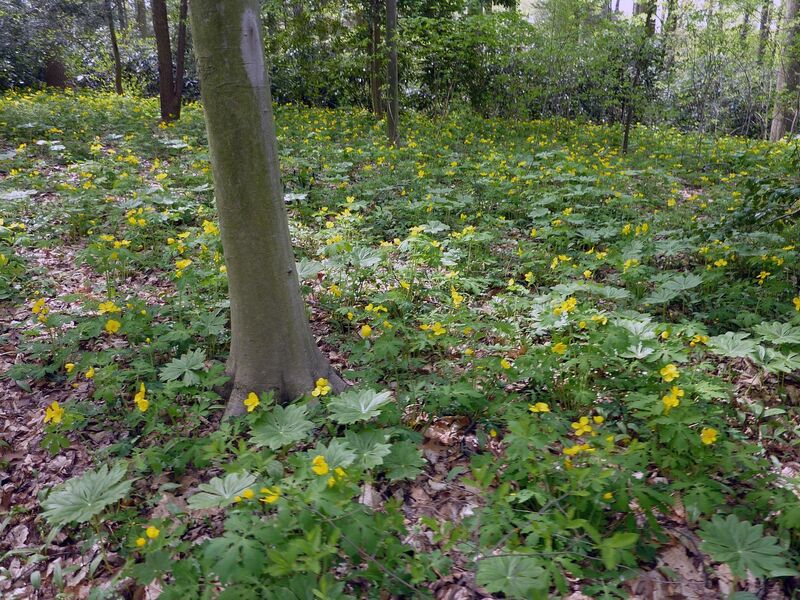 They're biannual and grow in "damp woodland" areas. Though I've found anywhere that has leaf litter tends to have some dampness to it whether it's near the river or up the hill. The two species started to blend well with one another, the yellow playing off the purple. 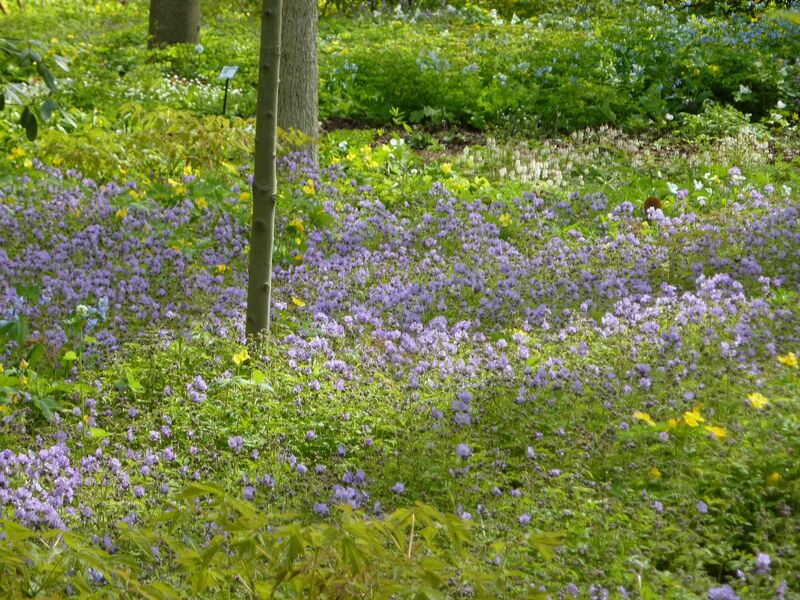 Woodland Poppy is actually a perennial but they seem to hold their own against the Phacelia, and it's likely the gardeners at Mt. Cuba help thin these out when they grow too abundantly. 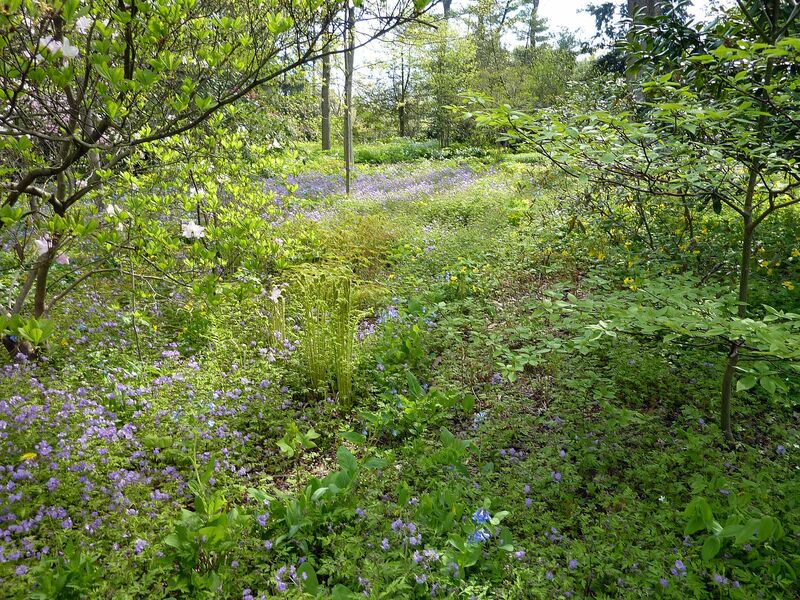 I recall years ago that Virginia Bluebells used to overwhelmingly conquer this part of the garden. 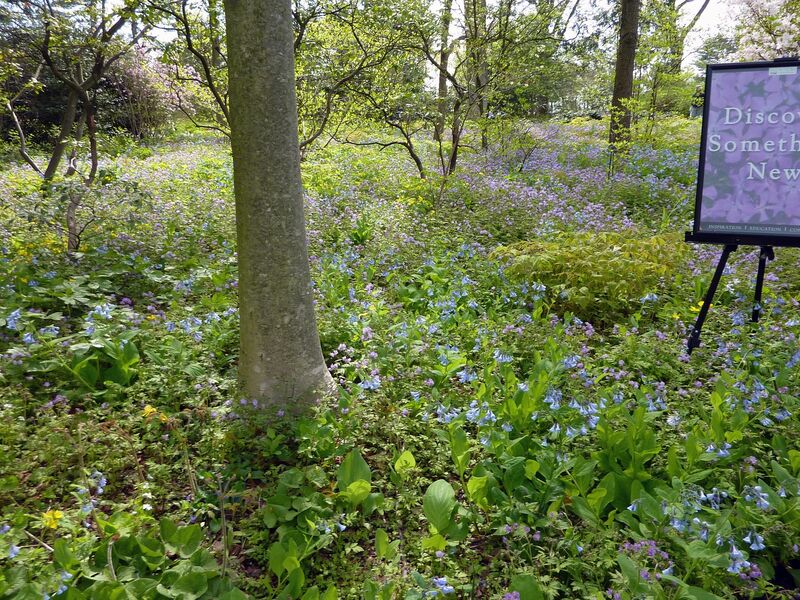 Here's one of the few parts of the garden where one can see through to another path, normally they have shrubs planted to block this from happening. 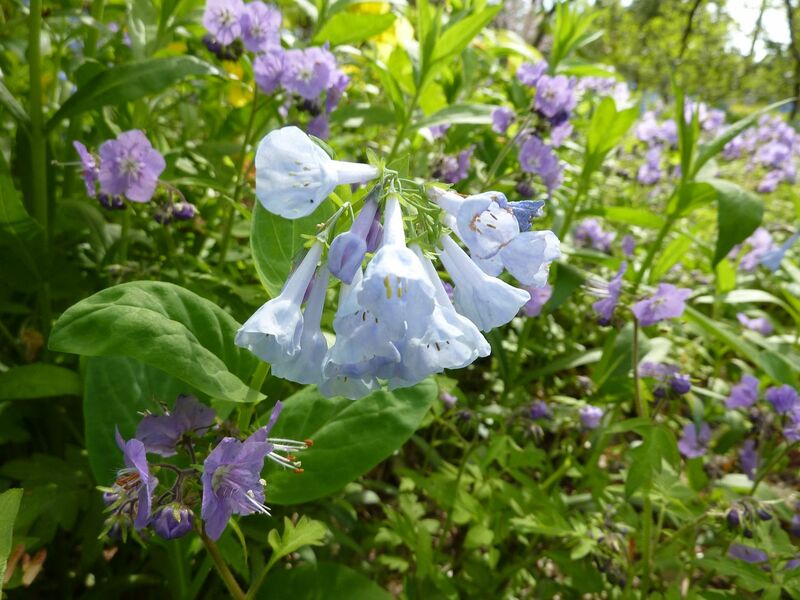 Virginia Bluebells, Mertensia virginica, joined in shortly after, but not in the vast sweeps I remember it. 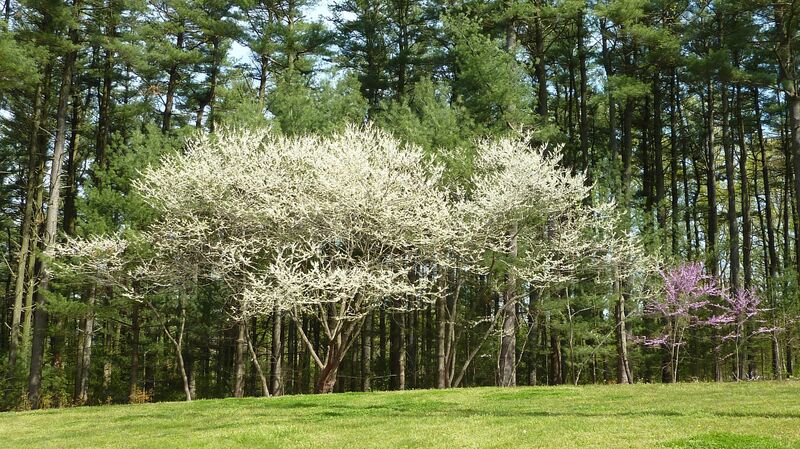 They can be aggressive plants, spreading both by seed and dividing underground in all directions. I'm told their roots run deep too, making them difficult to weed but even if one were to weaken the plant it would still be enough to add more things around them. and this made an amazing effect. I would love to get these three plants as a seed mix with maybe a dash of a few other species to dot here and there. 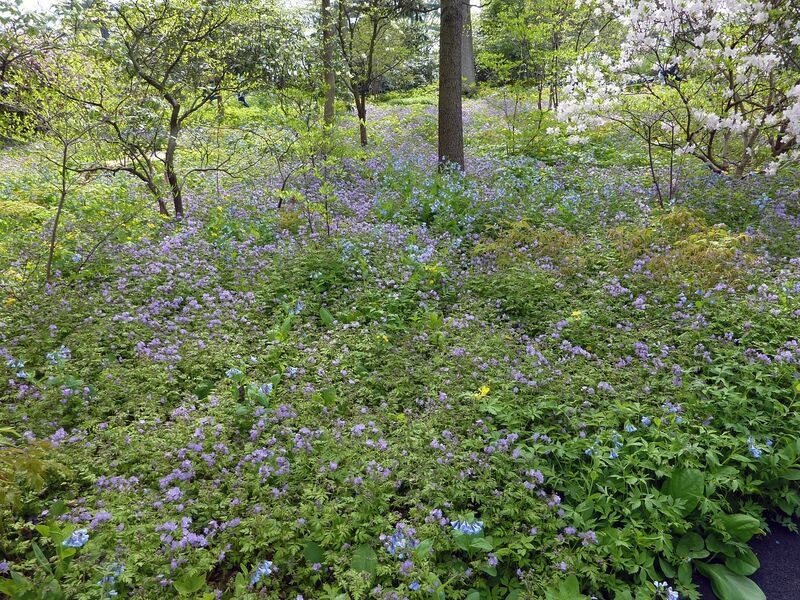 These three formed the bulk of an amazing carpet of flowers. And they work so well together. They were growing under Rhododendrons and shrubs I couldn't identify. 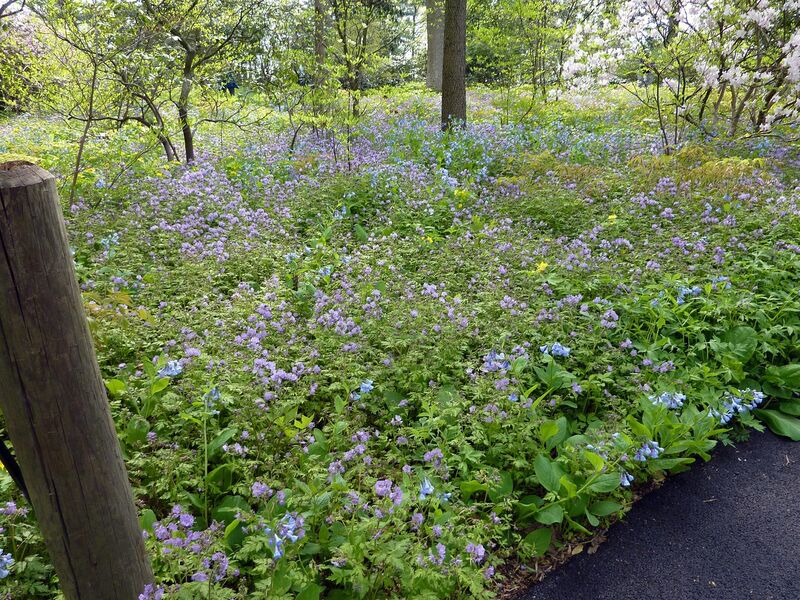 In reality they were only this abundant along one or two of the paths and then turned into smaller specimen plantings elsewhere. 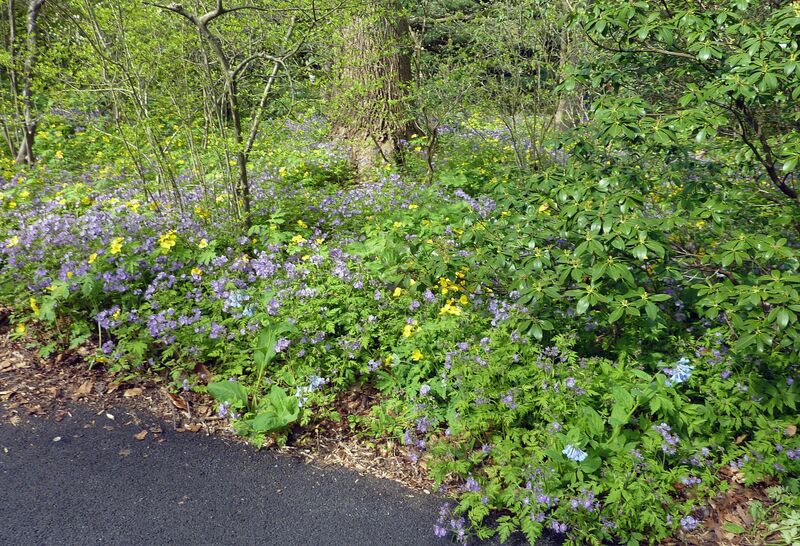 But what a wonderful filler plant these are for all those places just off the beat and path. This is how I want my shade gardens to look. This was one of their Rhododendrons that was flowering and looked very pretty. They have a lot of different species (including one that flowers later on in July or August!) but most weren't blooming yet. 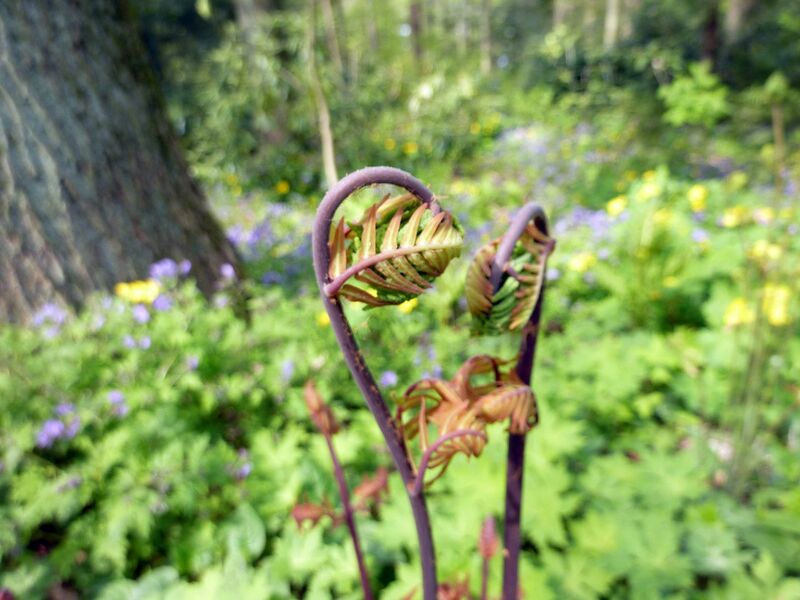 An assortment of ferns were mixed in all over among the gardens that were poking up with their golden fiddleheads, waiting to take center stage. 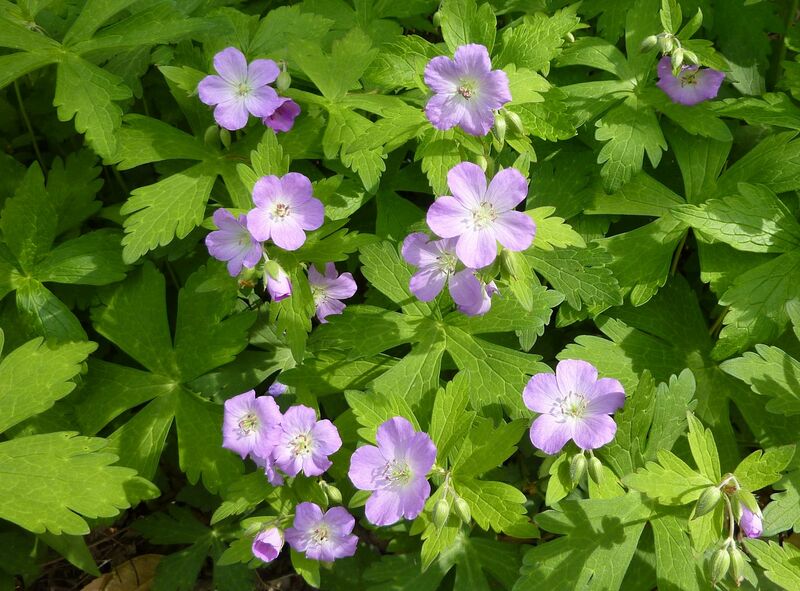 Wild Geranium, Geranium maculatum, was used more heavily in slightly more formal settings. Presumably because it doesn't spread as prolifically as the others. 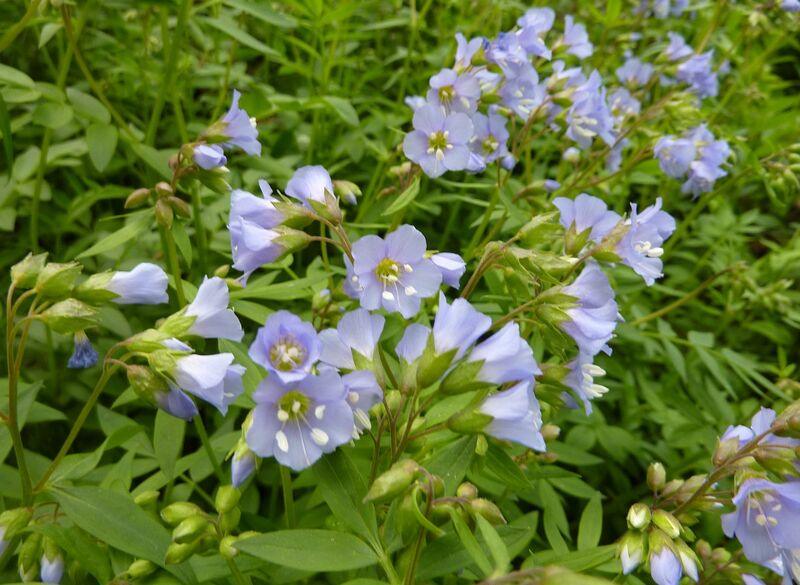 Jacob's Ladder, Polemonium caeruleum, was also used to make up some of the blue in the forest floor, but not as extensively as the Virginia Bluebells. 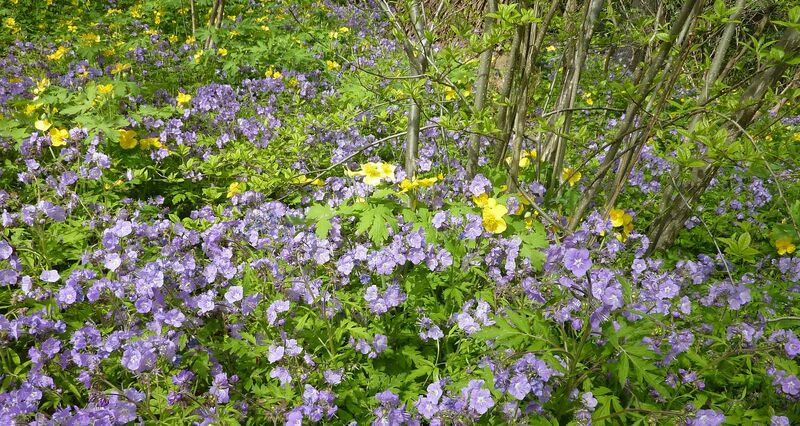 Jacob's Ladder is another plant honeybees love, though I rarely get the chance to see enough of it growing together to get their attention. Bumblebees and mason bees were all over everything though. 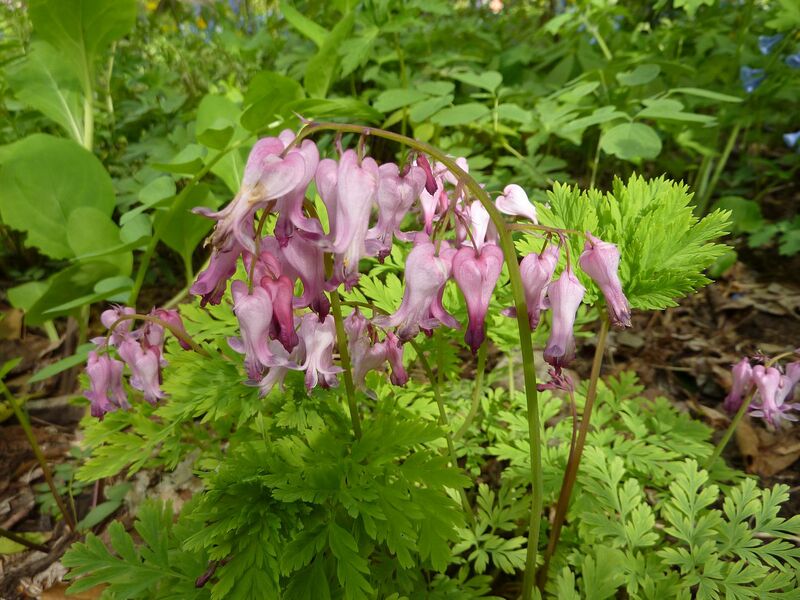 Fernleaf Bleeding Heart, Dicentra eximia, were also used here and there. I even found the white form along a pathway. 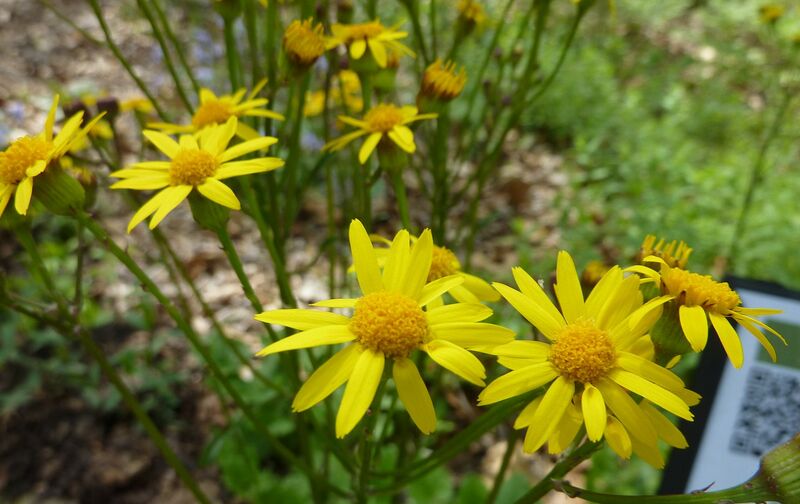 Golden Ragwort, Senecio aureus, lit up some of the particularly dark places in the garden. This is a wonderful plant that's easy to grow. They spread by seed and underground rhizomes, and I've even noticed their seeds are sought after by certain types of birds including goldfinches. Also in the photo are codes you could take a picture of with your phone, and the directs you to their web page with all the growing instructions on it. 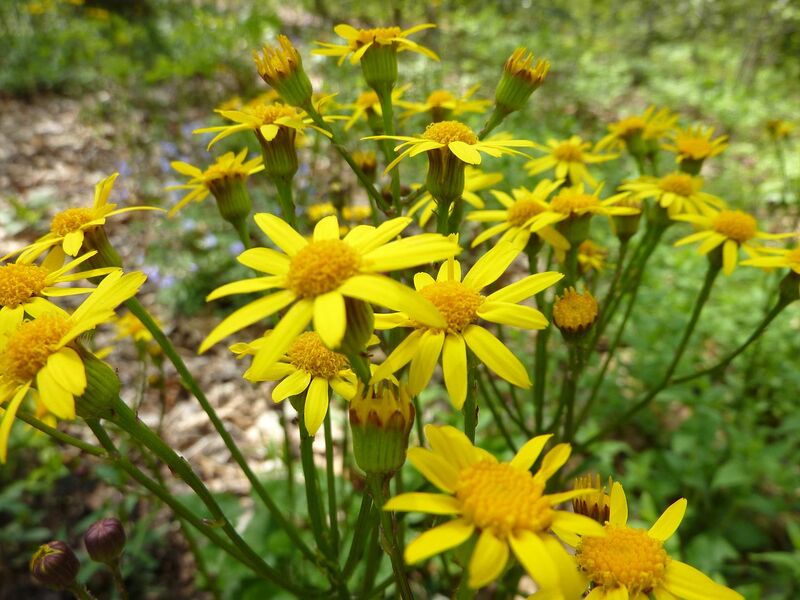 The first 500 people to visit that day got to take home a free plant, and this year Golden Ragwort was it. 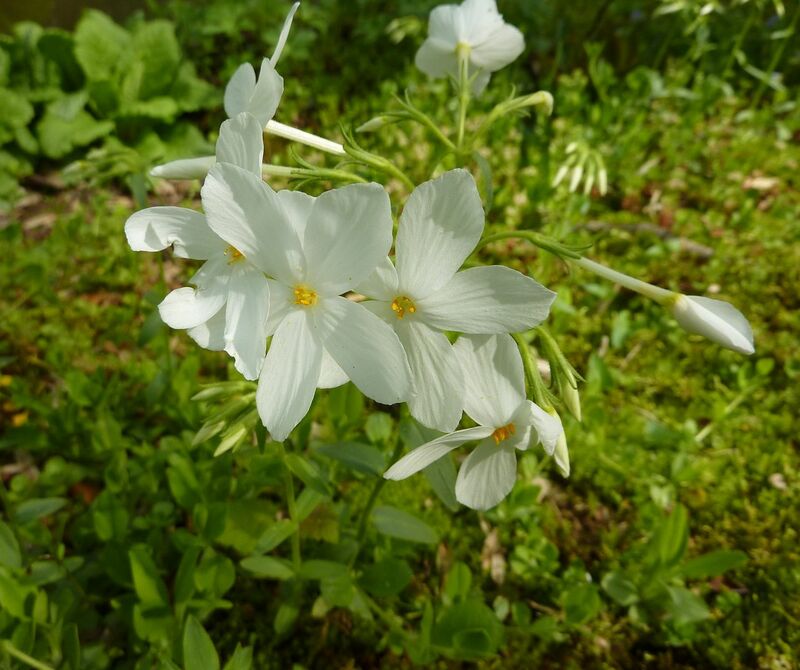 This was a rather short Phlox of some sort. White flowering obviously. There wasn't much of it but I thought it was neat. Phlox is surprisingly easy to start by seed which is what got me interested in this little plant. 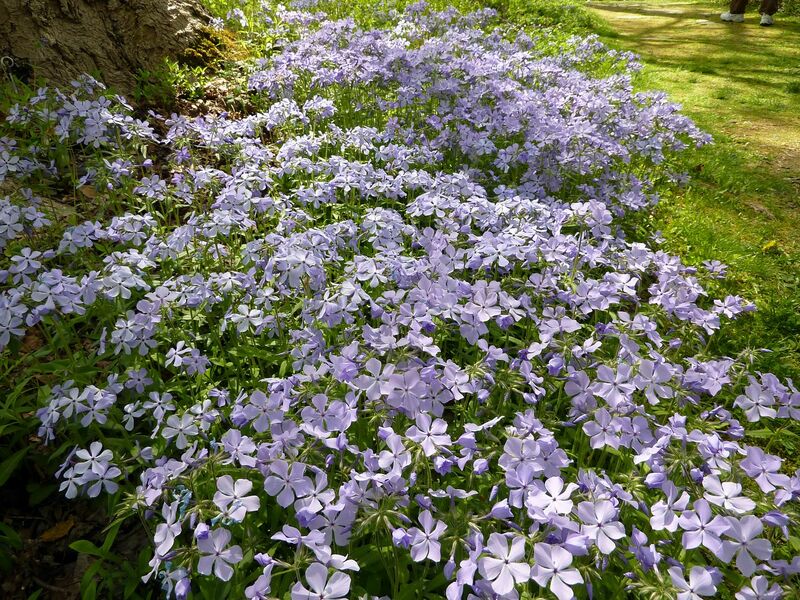 Woodland Phlox, Phlox divaricata, was used more formally along a few paths. 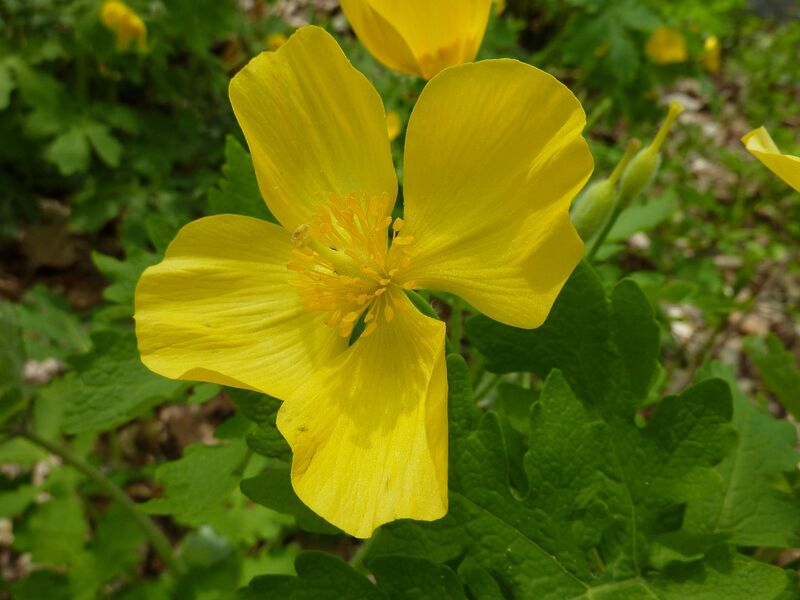 In previous years it had mixed with Foam Flower but those weren't really blooming yet. 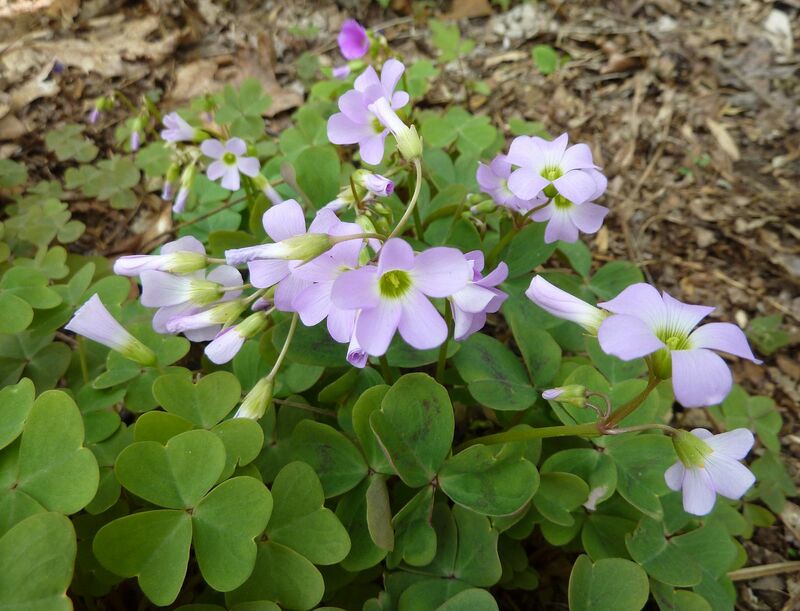 Violet Wood Sorrel, Oxalis violace, actually opens up a brilliant hot pink/magenta color but quickly fades down to a pale pink color. 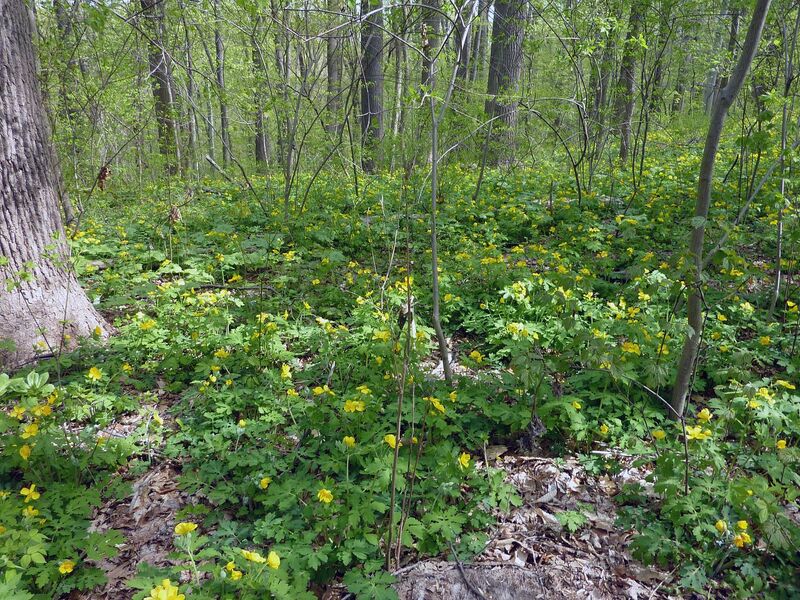 The leaves to this genus looks almost identical to those common sorts of Clover. 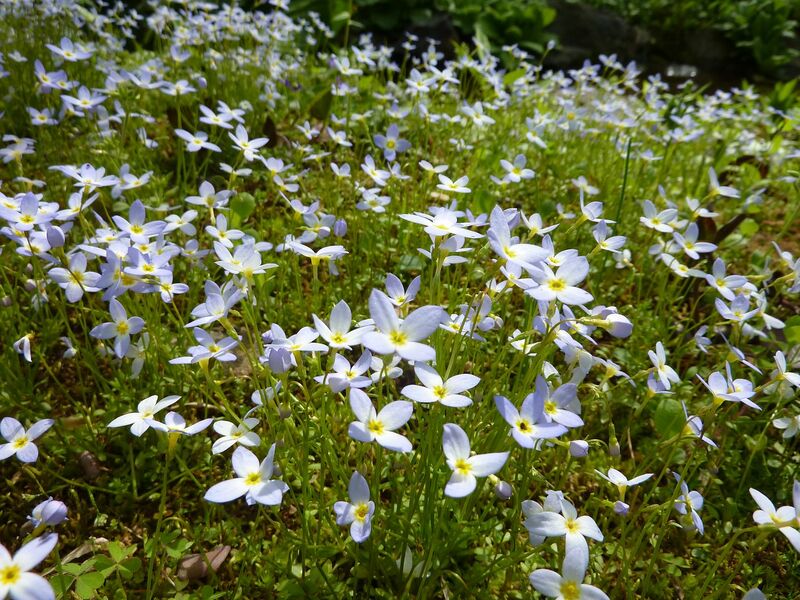 Bluets, Houstonia caerulea, seem to have changed their position in the garden over the last few years. They're a very delicate (biannual I think) plant that needs just the right conditions to grow. 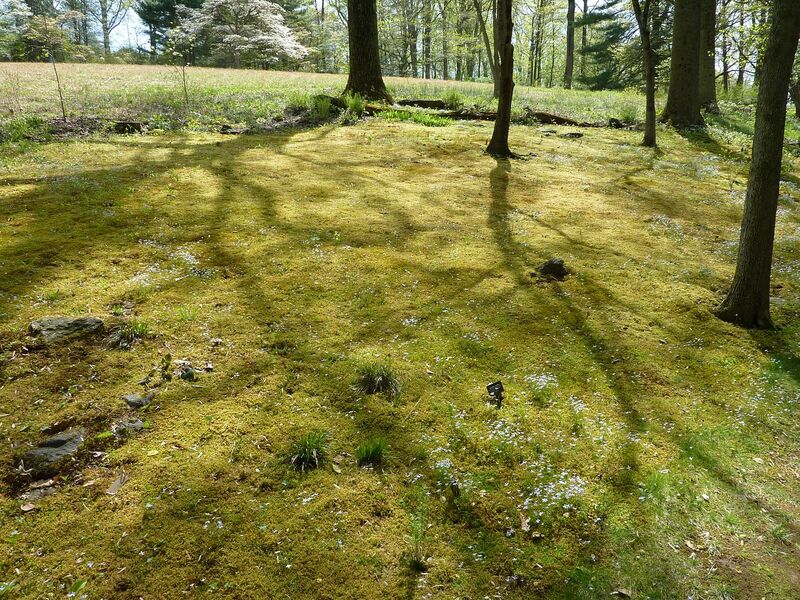 Moss and slightly dampness over the summer months seems to be critical but also there can't be any other large plants around that would out compete them. When successful they grow to form a great big patch. Up the hill is where they were previously in the gardens for many years. 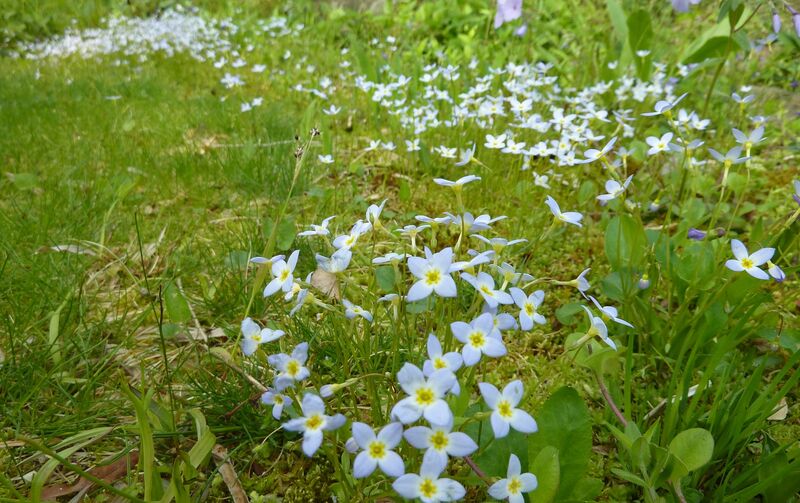 I remember seeing this at it's peak and there were so many Bluets flowering that I honestly mistook it for snow. 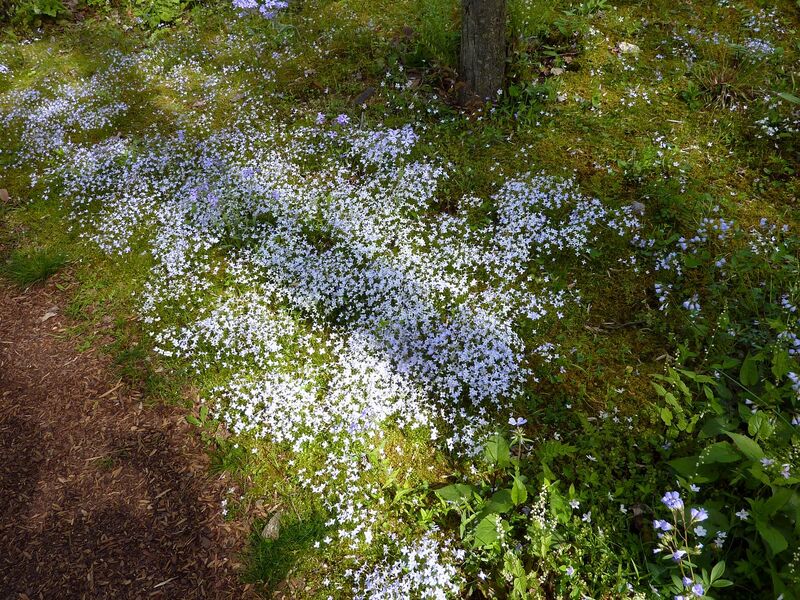 Now though it's mostly just a patch of moss, and almost all the Bluets have either been transplanted elsewhere or died out mysteriously. I didn't get a chance to ask the gardeners what the case was but I feel it's a little shame there aren't as many here as there once was. Going to Mt. Cuba Tomorrow!